The BritBox Blog features articles about classic British cars: restoration, maintenance, the driving experience, history, and anything else related to ownership. The blog's content does tend to favor the Triumph TR250 (for obvious reasons) but I admire and respect all of the vehicles Britain produced during its automotive heyday. I wish I had one of each, although I also enjoy being married and would like to continue that relationship. After buying a TR250, spending five years restoring it, and then driving it for the last decade, I've learned a few things. Most of that information came from books, the Internet, conversations with other owners, and my own experiences. I've also learned how much I still have to learn! It was supposed to be a two-day project – one day to take things apart and measure them, and a second day to install new parts and close everything back up again. Thrust washer failure is a common condition for the 6-cylinder Triumph TR engines. The two half-round flat bearings that control the crankshaft's axial motion are known to wear down and fall into the oil pan. When the thrust washers throw themselves into the murky goo, your crankshaft obligingly pulverizes itself and the engine block into expensive scrap metal. I've checked The Sporty Red Car's thrust washers at least twice over the past decade, but not in the last four or five years. Lazy dog, me. The tolerance was marginal the last time I measured it, but not quite yet in the "oh, crap" zone. I've been spending time on the 6-Pack forum lately (the Triumph TR6/TR250-specific club and information base), and thrust washer horror stories are a common theme. I love driving my TR and I also enjoy working on it, but I've neglected my roadster for far too long, thanks to preoccupation with fixing up my old house, buying my new house, selling my old house, and fixing up my new house. It was time to take action and give my Triumph TR250 some lovin' care. Once you raise the car on stands and commit to removing the 200 or so oil pan bolts (it just feels like that many), you might as well poke around a bit and see what else is going on down there. I pulled one big-end bearing cap just to have a look. I didn't check for roundness, but the surfaces looked very good and my Plastigauge indicated normal tolerances. I torqued two new big-end bolts to spec (the old ones are considered "stretched" and not re-useable) and moved on to the main bearings. The original Vandervell-brand bearings had worn to the point of showing a lot of the copper layer. Fortunately for me, the crankshaft journals still looked great. I Plastigauged each used bearing and ended up ordering new, standard clearance County bi-metal replacements. I didn't see the point in buying premium tri-metal washers – there is a high likelihood that the moving parts are out of spec enough to grind my new bearings into paste, sooner rather than later. I intend to pull the engine and rebuild it, maybe as soon as this winter, but I couldn't bring myself to put the old worn bearings back in. Now, the main reason I started this project: the thrust washers. It is not easy to get a thrust washer reading from outside the engine, although it can be done. It's tough, though; there's a lot of stuff in the way and good luck getting your dial gauge lined up. I already knew I was going to pull the pan, so I took my measurements directly from the crankshaft webs. The "normal" range of end float is between 0.006" and 0.008" and my averaged reading was 0.011". Worn out, but not a crisis. Considering the engine's mileage must be in excess of 80,000 miles, not bad at all. I guess I'm a big fan of Triumph's Vandervell bearings and thrust washers. I love to boast about classic British car parts availability, but trying the line up my list that included main bearings, thrust washers, two big-end bearing cap bolts, eight main bearing cap bolts (can't re-use them, either), oil pan gasket, and associated seals and whatnot proved to be impossible to source from a single vendor. To complicate things even more, I had decided to replace the gearbox oil since I was going to be under the car anyway. My Moss distributor did not have Red Line 75W90NS synthetic in stock; I waited for Moss to ship it to him, and after a week's delay he and Moss sent me Red Line's synthetic differential oil by mistake. Although it was more or less sorted out in the form of a refund, I ended up getting the stuff from Summit – by no means a Triumph specialist! It was in stock, they are in Ohio the same as I am, and the product arrived quickly and for a reasonable price. Thanks to back orders, long shipping times, and dealing with unexpected home maintenance issues, my two-day project ended up taking six weeks. There's been so much rain lately, I don't think I missed much driving time. I've changed thrust washers and bearings before, but it was a spare TR6 motor that was flipped upside down on an engine stand. Funny how much harder it is when you are laying on your back, with chassis schmutz in your eyes and assembly lube dripping honey-like down your arms. A few more days and I'd have the neck muscles of a Formula 1 driver. After the past year's challenges, home improvements, and construction projects, that greasy space beneath the Sporty Red Car was my refuge, my chapel, my Nirvana. Everyone in the US seems to be complaining about gasoline prices, which have increased almost a dollar a gallon in the last few months. I know the cost is (and has been) higher in other parts of the world; it's still a kick in the shins of our fragile economy. As if the effects of supply and demand were not enough to rattle a shaky market, investors and speculators have managed to enrich petroleum producers to degrees that would embarrass other businesses that are, unlike Big Oil, not aligned with Satan. Without spending more time talking about how we all came to be in this mess, let me say I am feeling the pressure that rising fuel costs have piled on my budget. I live in a rural area and have no public transportation options, so I must commute by car. My well-worn Japanese daily driver delivers 30 MPG if I drive as I know I should. That kind of gasoline mileage is reasonable as it is, but I think my next car will have to do better! There's no telling how much higher fuel costs will climb in the months and years ahead. Where does this leave classic car enthusiasts? I mean, I love working on my Triumph, or cleaning it, or talking about it online. Heck, I even like to stand in the garage for hours at a time (please don't tell my wife), gazing at my car lovingly. But you're supposed to drive these old machines! 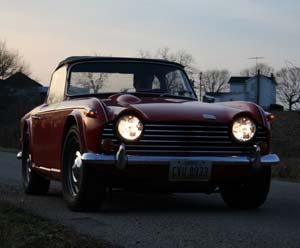 I often refer to my TR250 as a "sunny day daily driver" because I choose The Sporty Red Car every chance I get. As I mentioned, I live in the boondocks, and the best part of my commute is when I escape the six lanes of minivan and SUV congestion around where I work and simply motor about the twisty backwoods blacktop of Ohio. My vehicle is insured for any and all uses, with no restrictions. 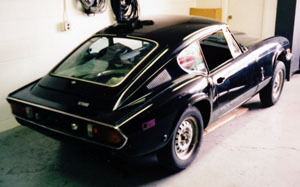 I built the car to drive it, and most of the effort was intended to make the Triumph as reliable and safe as possible. Seems to be working pretty well so far. I have mixed feelings now. I strive to make every drop of gasoline count. Like many other Americans, I've cut back on the number of miles I drive every week. I've tried to be more fuel-efficient—I analyze each prospective trip and decide if it's really necessary or could it perhaps be combined with another errand or deferred altogether. Are we really out of antibiotics? How high can we let the grass grow before the authorities intercede? I have conflicting feelings about how pleasure driving fits into this new reality. Motoring around in The Sporty Red Car is one of my favorite pastimes (obviously) and it's becoming more difficult to muster the cash to fund our little excursions. My wife and I used to fill the tank on a sunny day and just go get lost. Not only is a full tank well past fifty bucks nowadays, I feel bad about "wasting" a precious commodity. Oh, well. 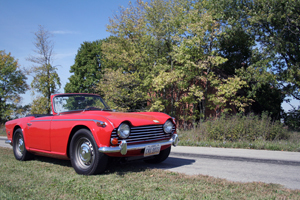 If I don't drive my classic British roadster, who will? It's not like I didn't have enough to worry about. I was halfway through the 5-year restoration of my 1968 Triumph TR250, with plenty left to do. The problem was enduring the YEAR my car sat in a body shop (a story for another day), waiting to have sheet metal replaced and a comprehensive re-spray. After expending all the energy and momentum to produce a dipped, repaired, and rebuilt rolling chassis, it was difficult for me to sit still while waiting for my car's return. At least there were a couple of Triumph gearboxes down in my basement workshop, but that was just a winter project. I embarked on rebuilding a TR250 gearbox that ended up going into the car, and I also did an early TR6 box simultaneously. That one went into my collection of "reserve" parts. Since I had no prior experience rebuilding transmissions, the second one was my backup in case the "primary" TR250 gearbox stripped all its teeth and ground the bearings into silver-gray mud. Ten years later, it's still working. I had a habit of scanning the local newspapers for interesting cars and parts—yes, we did it with newspapers back then—and came across a local 1973 Triumph GT6 mk III. The car was only five minutes away from where I worked, so I had to see it. As my TR250 had also been, it was a failed restoration. The owner and his brother had bought a lot of parts but then became too busy with their families and jobs, and they lost interest. The seller was only asking $750, and better yet, I was able to persuade him to trade the car for some high-end audio equipment I had. We swapped a classic British coupe for a nice stereo. I had the GT6 flat-bedded home and pushed it into the garage. I played around with it for a few months, sorting parts and getting to know the car a little better. It was in fairly decent shape overall, but the engine and gearbox had been completely disassembled and it needed a new driver's side floor pan welded in. When the TR250 finally came back, the GT6 was pushed to the rear of my 1-1/2 car garage, which was just deep enough to fit two Little British Cars nose-to-tail with a piece of paper in between them. That arrangement did not last very long before I regained my sensibilities. I cherry-picked new GT6 parts that were useful to my TR250 restoration (a surprisingly high quantity) and put the rest of the project on eBay. A nice couple from North Carolina (or maybe Virginia) hauled a trailer and their two kids all the way to Ohio to pick up the car. I sold the GT6 for close to what I paid for it, plus I kept the new parts I wanted. I always liked Triumph's GT6. Maybe I'll have another chance some day. The Michelotti styling and sporty fastback coupe design call to mind a "poor man's" baby Jaguar E-Type. They're quite small—you don't really sit in one; you more or less wear it. The tilting front cowl is super-cool, and sitting on a tire while tuning the car is a big plus. I gave up the GT6 because the return of my TR250 made me realize I had more than enough to do, and there are limits to time, money, talent—and in the case of car restoration—love. I'm not going to say my Sporty Red Car has never seen rain since its restoration—it has, but only a few times and by accident. The first instance was three or four years after the Triumph TR250 was finished, probably on or around the five-hundredth time I swore a raindrop would never hit it. You push your luck's limits and then there's a reckoning. My resistance to rainy-day motoring is not just about being obsessive and controlling. I have no shortage of those. Stubbornness perhaps? I did spend a lot of money and time and money and effort and money repairing the ravages of nearly thirty years' moisture being trapped inside the Triumph's secret places. After a while you start to feel like you're renovating a colander or maybe a screen door. That's how porous these leaky old British roadsters seem to be. Even washing the car requires diligence, follow-through, and plenty of towels. Be careful where you point that hose! I rebuilt, renewed, or replaced almost every major system or component in that car. I wanted a car that was safe, reliable, and, well, attractive. One of the only things that defeated my best efforts was the windshield wiper motor. Sure, I disassembled it, cleaned it, stripped the case to bare metal, replaced the brushes, etc. I tested it on my workbench and it seemed okay. Once reinstalled in the car, though, it never worked. Switching on the circuit would cause a tiny flicker of motion and that was it. Not even a single stroke to clear a few drops or a light mist of rain. One theory is that I screwed up the wiper gearboxes. When reassembling the firewall/dashboard components, I may have blown it. I will admit this area is one of my least favorite parts of the car, as far as working on it is concerned. Here's how much I dislike it: I didn't notice I had forgotten to connect the scuttle vent to its little lever under the dash. I then saw I would have to start taking things apart again. To this day, I open and close the vent by pushing or pulling on the vent lid. Not while I'm driving, of course! Over the last ten years, I've been caught out a couple of times. My wife has coaxed me into "just a little ride through the boonies" on a few occasions when the weather forecast was iffy. You're out having fun on the 2-lane country roads until you figure out a storm just came between you and home. Up goes the top, and out of my mouth escapes another whispered curse that I never got around to comprehensively troubleshooting my immaculate-looking Lucas windshield wiper motor. I didn't grow up with British cars. My family, friends, or neighbors didn't own one when I was a kid, so I had no memory of experiencing them. I remember a blue MG MGB-GT that parked in the alley next to the corner grocery store. One of my older sister's best friends had a battered white Triumph TR4 that resisted my sister's boyfriend's best efforts to keep it running. Larry was a skilled mechanic when it came to American cars—and even Volkswagens of all things—but that TR4 defeated him. I liked cars in general. At an early age I developed an almost encyclopedic mental catalog of automobile specifications, features, and even Consumer Reports ratings; all of this well before I was old enough to drive. I was a bit of an anorak, back before a kid growing up in Ohio could even know what that was. "Geek" had not yet taken on its current meaning, but I was one anyway. I also became interested in auto racing, particularly sports cars and Formula 1. Exposure to these more "European" elements made me aware of brands, models, and history that existed far away from Detroit, America's Motor City. My dad took me to the local Jaguar/Triumph dealer when I was probably about thirteen or fourteen. Dad dreamed of owning a sporty roadster, and we spent some time looking at cars that day. Triumph's entry-level Spitfire seemed almost affordable to my recently divorced and definitely un-wealthy father. At his suggestion, I climbed into the driver's seat of a British Racing Green convertible with tan interior, and put my hands on the steering wheel. The wood dashboard face, abundant instrument gauges, rocker switches, and center console-mounted shifter spoke clearly to me of an alien, alternative automotive culture wholly unlike that of my mom's new 1971 Chevrolet Chevelle Malibu. The Triumph Spitfire fit me like my own jeans, t-shirt, and sneakers. Here was a car scaled perfectly to my barely adolescent frame. The whole concept of scooting about in a roofless vehicle seemed absurd and most desirable—much like carnival rides, or the daredevil bicycle stunts my boneheaded friends and I always attempted. Despite his fascination, my father never owned one of those beautiful Michelotti-styled little cars. Years later, Dad moved from Ohio to California and then eventually to Arizona, where he resides today. My time spent together with him became very infrequent due to the miles between us. Not long after my Triumph TR250's restoration was completed, my father flew back into town to attend my nephew's high school graduation. Time was short, but I managed a day off from my new job and took Dad for a ride in the car he had heard so much about during its five-year rebuild and reanimation. It was a perfect day as we buzzed along some of my favorite roads, and then I pulled over to the side of the shoulder and told the Old Man to take us home. He seemed reluctant for about a nanosecond while his seatbelts were adjusted, arguing he had not operated a manual transmission of any sort in decades—and then we were off. To his great credit and my secret joy, he didn't miss a single shift. Speed is not absolute, it is relative. It needs context. When you travel on a commercial airliner, does your environment make you actively aware that you are arrowing through the ether at 500 miles per hour? Likewise, riding a bicycle down a steep, winding hill might see you peak at 40 mph. Which trip left you with a lengthier catalog of exhilarating sensations? There are plenty of classic British cars capable of performance that pins you to your seat and sends passengers' hands clawing for some kind of grab-handle. Jaguar E-Type, Sunbeam Tiger, AC Cobra, any Aston Martin—these cars have always and will continue to shock and delight anyone who has the great fortune (literally and figuratively) to own one. The Jaguar Mk II and Rover 2000 TC were popular as police interceptors, so 2-seat roadsters are clearly not the only path to high-speed Britcar enlightenment. Thanks to common-sense marketing practices, the cachet of these highly evolved and superbly quick machines was filtered down to more plebian offerings within their respective brands. Plebian only in direct comparison! In their day, the Austin Healey 100 and 3000, MG MGA and MGB, Triumph TR series, and Sunbeam Alpine all gave their owners an opportunity to experience spirited motoring in an everyday car that was far more affordable yet still possessing attributes like a wood dash, torquey inline engine, manual gearbox, and—a big plus—the potential to ruin any hairstyle. Many of these convertibles were all-season daily drivers, some of them even fitted with studded snow tires and crawling valiantly to the front line of the annual battle between Man and Winter. And then there's the Little Guys—the Austin Healey Sprite, MG Midget, and Triumph Spitfire. Scaled to European roadways and garages but embraced by the North American market nonetheless, these pocket-sized roadsters inherited many of their siblings' features and, well, character. While perhaps not offering the bigger cars' acceleration, top speed, or even the space to stow a suitcase, a sub-miniature sporty car still transports its own cargo of tactile sensations—the smell of damp carpet blended with singed oil, the whirr and occasional clash of gearbox synchros, and the tingle of wind-blasted skin. Although top-down motoring defines the British car experience for many, the tin-tops have a charm of their own. The ubiquitous Mini is the most famous of these. Beginning in 1959 and in continuous production for over forty years, this revolutionary example of Sir Alec Issigonis' genius endures and endears not just because of its brilliant mechanical layout and superbly efficient use of space—it's also a blast to drive. The Mini's admirable road-holding ability and handling are often compared to that of a go-kart, and quite justifiably so. Moving upward in size, the small and medium British saloons often attempted to emulate the posh appointments of their larger and in some cases much more lavishly equipped cousins, but many of them are just plain fun to drive. The majority of classic British cars, when considered objectively, are not particularly quick. A percentage of them are ergonomically challenged, or optimistically engineered, or indifferently assembled. It does not matter. The modern enthusiast is not bound by the constraints of "value" or "practicality" that defined these cars in years past. There is no definitive standard of measurement that ranks a vehicle's speed in relation to the driver's goofy, self-satisfied grin. © 2005-2016 The Classic British Car -- All Rights Reserved.